Mail Online has paid £150,000 in libel damages to a family after columnist Katie Hopkins wrongly claimed three of its members were Islamic extremists in two separate articles. The first of Hopkins’ columns, published on 23 December last year, suggested brothers Mohammed Tariq Mahmood Mohammed Zahid Mahmood had links to Al Qaeda. Hopkins suggested the pair had lied about wanting to go to Disneyland on a visit to the USA and that Homeland Security were right to prevent them from boarding their flight. The article was titled: “Just because Britain’s border security is a Mickey Mouse operation you can’t blame America for not letting this lot travel to Disneyland – I wouldn’t either”. In a second piece a few days later on 29 December, Hopkins suggested that Hamza Mahmood, son of Tariq, was responsible for a Facebook page allegedly containing “extremist material”. The article included a picture of the Mahmood family home, which Hopkins described as a “known hotbed of extremism”. Its headline read: “A brave Muslim tried to warn us this week about the extremists taking over his community. What a tragedy it is that our PC politicians would rather not know”. Both articles were denounced as “sensationalist” and “Islamaphobic” by the Mahmood family. An apology published online by the Mail Online earlier today said: “We are happy to make clear that Tariq Mahmood and Zahid Mahmood are not extremists, nor do they have links to Al Qaeda. “Hamza Mahmood has pointed out that he is not responsible for the Facebook page, which was linked to him as a result of an error involving his email address. “We are happy to make clear that there is no suggestion that either Hamza nor Taeeba or Hafsa Mahmood (Hamza’s mother and sister) have any links to extremism. A lawyer for the Mahmood family said the allegations against them had been “false and deeply distressing” and were made in “typically sensationalist terms”. 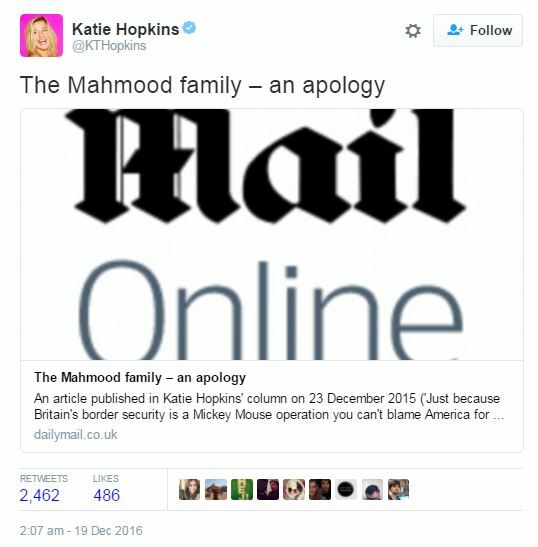 Mail Online also agreed to pay the Mahmood family’s legal costs after they brought a libel complaint against the Mail and Hopkins. “Neither was able to put forward any defence or other justification for these appalling libels,” a statement from Carter Ruck, the family’s lawyers, said. Hopkins tweeted a link to the apology at 2am today to her 667,000 followers. 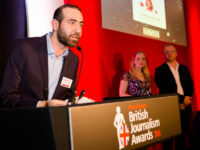 In a statement, the Mahmood family said: “We are very pleased that, after a great deal of dragging of their heels, the Mail and Ms Hopkins have now accepted that what they published was completely false. “Even to this day the US authorities have not explained the reason why we were not permitted to travel; we assume it was an error or even a case of mistaken identity. 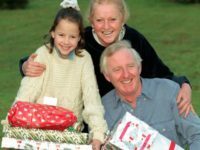 “However, matters are not helped when such sensationalist and, frankly, Islamophobic articles such as this are published, and which caused us all a great deal of distress and anxiety. Alex, I don’t see how you gleaned that. Although Vernon didn’t clearly explain that his critique of Islam is coming from the point of view of a Westerner objecting to an alteration of societal make-up with non-Western ideas, nevertheless, I grasped that as the context and further understood his point to be roughly this: Islam is a deeply flawed religion so that even adherents to non-extremist versions of it are likely to hold views inconsistent to established Western attitudes. This is particularly clear as regards social status of women, LGBTQ, and animals, all of which are very differently handled in Islamic societies. You don’t have to be Al Qaeda to be anti-homosexual, misogynist, and disgusted by dogs; these are typical Muslim attitudes. I was friends with a very sophisticated Iranian couple who sometimes lived in London, where they had a flat in my mother’s apartment block. The husband, who was pursuing a PhD in psychology, literally backed away in nervous giggling fear and left a gathering at my mum’s because a friend of mine had arrived with a long-haired chihuaha. We did not exclude him nor make him feel uncomfortable by taking a prejudicial attitude to his faith; he self-excluded because of his own cultural superstition. Islamophobia is far more rational than my mum’s Muslim neighbor’s Cynophobia (fear of dogs). So what you are saying is that fanatical Islamism justifies the libelling of Muslims not linked to it?